Home / Shop – Vintage Watches For Sale Used & Antique / Uncategorized / Omega Constellation with rice bracelet. Omega Constellation with rice bracelet. This 1961 OMEGA CONSTELLATION looks spectacular all around. The 34.5mm. steel and gold capped case looks fabulous and retains the correct OMEGA winding crown. The finely restored dial retains the original gold tone markers and Dauphine hands. The chronometer grade 551 automatic winding OMEGA movement was just cleaned and is accurately keeping time. The gold plated rice bracelet displays stellar overall condition. 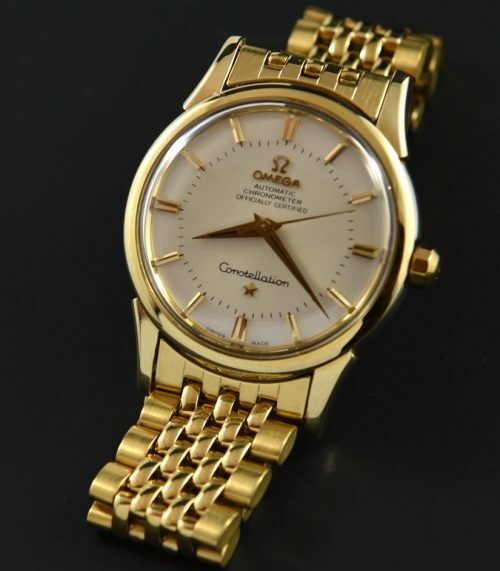 This very fine vintage OMEGA CONSTELLATION watch is priced well.